Legend has it that the name "Birkenhead" was given to this area by an early Auckland agent, auctioneer and broker, Samuel Cochrane, who registered the name in the Auckland Office of Ridings and Dowden on 23 June 1863 as that of a proposed subdision. He is said to have done so because the area reminded him of his home town "being across the water as Birkenhead is from Liverpool". Prior to this the Birkenhead area was generally known as the "North Shore of the Waitemata River" and present-day Chelsea was known by its Maori name of Wawaroa. The subdivision, surveyed by Charles Heaphy, was on the eastern side of the present-day Hinemoa Street, which shows as the most left hand street on the poster map. 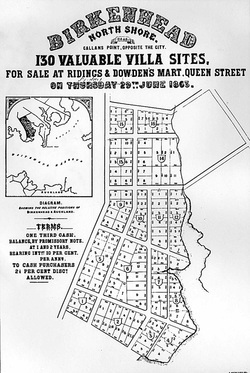 These posters were distributed around Auckland and the austion of the 130 valuable villa sites was set down for Friday 29 June 1863. The proposed subdivision was actually part of a much larger land block of 207 acres granted to Lt. Col. Robert Henry Wynyard (Commander of the famous 58th regiment) who subsequently succedded Sir Goerge Grey to become New Zealand's fifth Governor (1854 - 1855). The land grant assignment to this soldier-administrator was formalised on 26 Ocotober 1853 for payment of 207 pounds seven shillings and tenpence. Eventually, in 1861, the land passed into the hands of Samuel Cochrane. Whether or not the auction ever took place is a matter of conjecture as no records of sale appear in the land records. Nevertheless the name stuck, with the area subsequently becoming known as the Birkenhead Road District, and, in 1888, Governor William Jervois issued a proclamation setting up the Borough of Birkenhead.